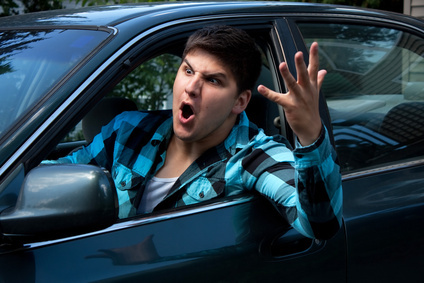 Aggressive Driving Can Cause Serious Car Accidents And Injury! You've likely seen this situation before (especially if you live in Wesley Chapel, so close to Tampa): someone is late for work, or an appointment, so what do they do? Hop in the car, half ready, and speed down 275 as fast as their car will go, coffee in one hand, cell phone in the other, knee on the wheel to guide it. You laugh because you know better – that's a sure-fire way to get into an accident! But a car accident injury is no laughing matter. Unfortunately, as funny as that scenario seems, in real life, it leaves few people laughing. Aggressive driving leads to car accident injury, and, sadly, even death. According to the NHTSA (National Highway Traffic Safety Administration), over 11,000 people are killed each year from crashes caused by aggressive driving. These crashes that result in a car accident injury or death are costly, nearly $40 billion per year for our nation. Aggressive drivers cost everyone a lot of money, and lives. Speeding. Any time you go faster than the posted speed limit, or exceed a safe speed for certain road conditions (construction, inclement weather). Road hogging. Making frequent lane changes in order to “get ahead,” whipping in and out of lanes. This is one of the major predecessors of a car accident injury. Tailgating. This practice of getting too close to someone to make them go faster or get them out of the way can lead to a serious car accident injury or fatality. Running red lights and entering an intersection when the light is yellow. Lack of attention to driving. Eating, talking on the phone, texting, putting on make-up, and drinking can lead to more aggressive driving, a car accident injury, or fatality. Expressing anger non-productively. Hand gestures, screaming, and yelling at others will literally get you nowhere on the road. These are all examples of aggressive driving, and they can result in a major car accident injury or death. If you read these, and discovered that you are, even occasionally, an aggressive driver, there are a few things you can do to reduce risk of a car accident injury or fatality on the road. Planning ahead, paying attention, relaxing by listening to your favorite music, and avoiding speeding are all ways to make the journey safer for you and other motorists. Avoid confrontation. Do not return rude gestures and avoid eye-contact with aggressive drivers. Call the police. In the event of a seriously aggressive driver, pull over and call highway patrol to report it. You may save lives by doing so. In another survey by the NHTSA, over 50% of drivers admitted that they participated in aggressive driving on occasion. If you see yourself in any of the above-described behaviors, take a moment to remember what it's like to be on the receiving end of aggression, and work on being a defensive driver. You can prevent a car accident injury or fatality by being alert, aware, and avoiding aggression.